AT least 83 per cent of 521 sitting MPs are ‘crorepatis’ and 33 per cent of them have criminal cases against them, according to a report by election watchdog Association for Democratic Reforms (ADR). The ADR, an NGO working in electoral reforms, has compiled the report after analysing self-sworn affidavits of the 521 MPs out of 543 members elected to the Lok Sabha in the 2014 elections. “Out of the 521 Sitting MPs analysed, 430 (83 pc) are crorepatis. While 227 of them are from BJP, 37 are from Congress, 29 from AIADMK, among others,” the report said. 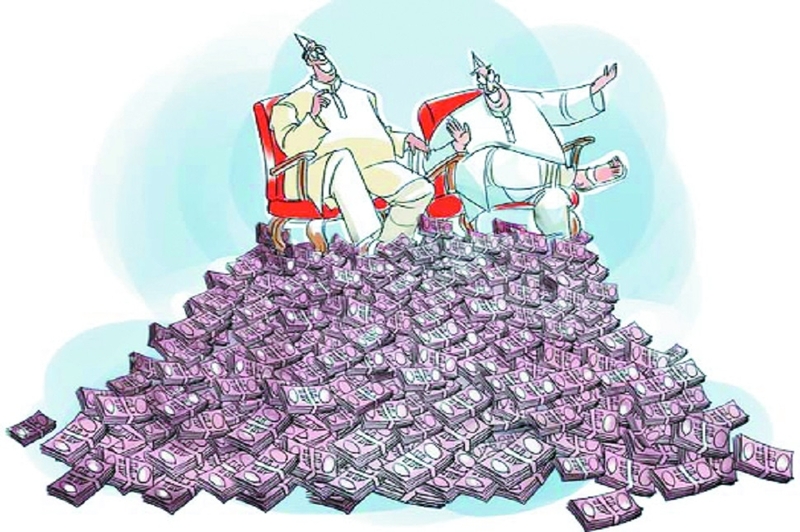 The average assets per sitting MP for Lok Sabha 2014 elections are Rs 14.72 crore. While 32 sitting MPs have declared more than Rs 50 crore worth of assets, only two sitting MPs have declared assets less than worth Rs 5 lakh. At least 33 per cent sitting MPs have declared criminal cases against them in the affidavits. “While 106 of them have declared serious criminal cases including cases related to murder, attempt to murder, communal disharmony, kidnapping and crimes against women, 10 sitting MPs have declared cases related to murder. Out of these, 4 sitting MPs are from BJP, 1 MP from INC, NCP, LJP, RJD, Swabhimani Paksha each and one MP is an Independent,” the report said. “Fourteen sitting MPs have declared cases of attempt to murder. Out of these, eight sitting MPs are from BJP and one MP each from INC, AITC, NCP, RJD, Shiv Sena and Swabhimani Paksha. Fourteen sitting MPs declared cases related to causing communal disharmony. Out of them, 10 sitting MPs are from BJP and 1 MP from TRS, PMK, All India Majlis-E-Ittehadul Muslimeen and AIUDF each,” it added.